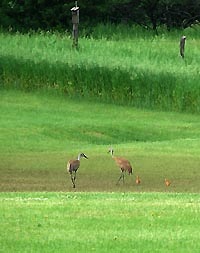 Sandhill cranes on a Rainbow Springs golf course. Scott Walker has been interested in the fate of the former Rainbow Springs Resort in Waukesha and Walworth counties for a long time. In 2008, as Milwaukee County Executive, he was “outraged” (and said so on talk radio) when the Doyle administration approved using stewardship funds to purchase the 970 acre property, including two golf courses comprising 240 acres. The failed resort borders the most pristine and intact river system in Southeastern Wisconsin. It is home to 55 species of fish and 15 kinds of mussels. In 2008 the land was purchased by the state with money from the Stewardship Fund. Public hearings were held and a restoration plan was approved. $3 million in federal money was secured to fund the project. By the time Walker became Governor in 2011, work already was underway to allow public hunting, fishing and hiking on the newly acquired land, and to restore its two dilapidated golf courses to wetland and prairie. While the towns of East Troy and Mukwonago were happy to see the property turned into public land, Walker had his own plans. Two days later, on February 24, it was announced that a new public hearing would be held March 10 on the fate of the property. DNR Executive Assistant and champion of trout stream privatization Scott Gunderson presided at the hearing, but was unable to generate enough enthusiasm for Walker’s scheme to challenge the previously approved plan. Part of the problem with what Walker wanted to do was that using money from the Stewardship Fund to maintain a golf course probably would have been illegal. Thus it was not surprising that golf enthusiast and Scott Walker lackey Senator Mary Lazich (R, New Berlin) announced in April of 2011 that she was drafting legislation that would allow for preservation of the two golf courses. 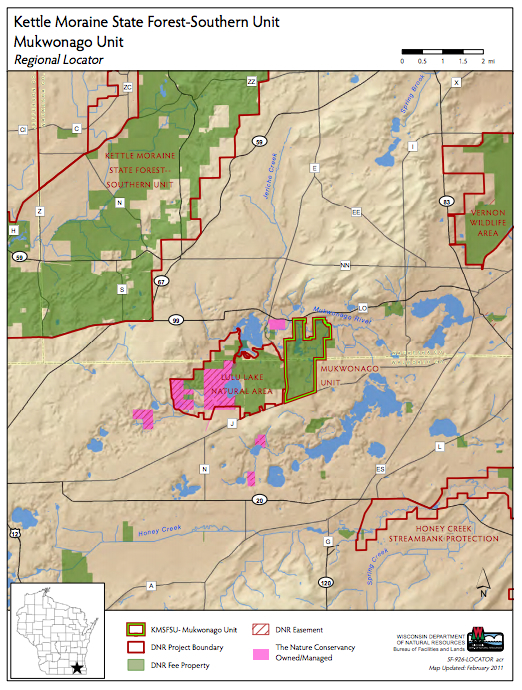 To Scott Walker's disgust, Rainbow Springs now is part of the Mukwonago unit of the Kettle Moraine State Forest. In the end, Walker lost. Declaring that he “would not have voted to spend one penny of stewardship money on a golf course” Board Chairman Jonathan Ela, drafted a lengthy resolution to oppose Lazich’s bill. The Natural Resources Board, various environmental groups, the surrounding communities, and even the Golf Course Owners of Wisconsin, campaigned to close the rundown golf courses and restore the Mukwonago River. They won, even in the face of Scott Walker’s long-simmering outrage. In short, Walker risked millions of dollars in federal money in order to force a community to keep two golf courses that it didn’t want. The Rainbow Springs story is a vignette of Walker’s attitude toward public lands and wilderness, and of his pettiness. Big Scott Walker fan – obviously. No surprise hat a liberal writer would leave out some important details to make a case against a republican Governor who was left a fiscal mess by his liberal predecessor — where was the media defending Walker as they did Osama Obama when he continually blamed the Bush administration for inherited fiscal issues. That’s part of the reason you were elected — promises to “fix” these issues. Funny how liberals have really short memories when it’s convenient. Additionally, as a PGA Member. there’s no way the Golf Course Owner’s Association of Wisconsin would approve closing a golf course. They’re in business to keep courses open and expand their industry. In the end, if they literally had no other choices, they may not have opposed the closure, but they never would have encouraged or supported it. There’s a huge difference between, “not opposing” and supporting. If any group should be aware of semantics – it’s the liberal media. Here’s an example — unemployment rate is down ——- less people are employed – go figure!!! Get your head out of the sand, and I’m being polite. The fiscal mess left by Doyle was mostly attributed to the Tommy Thompson/ McCallum administrations. Doyle inherited a 2 or 21/2 billion dollar deficit when he took office. Those are facts pal, look them up. The bush/cheney team nearly destroyed this country. They ran the country into immense debt, passed on the cost of 2 wars to Obama(he actually counted the cost into his budgets, they didn’t), let the inmates run the asylum, wall street and big business, by reducing regulations or looking the other way, and rewarded the wealthy with tax breaks that created far too few jobs. In fact, the idea that tax breaks for the wealthy creates jobs is a lie that has been purported by republicans on the American people for far too long. And if 5 or 6 companies control over 95% of the media in this country pal, I got news for you. There is no such thing as a liberal media. Talk about selective memory…………..